KIEV, Ukraine -- Ukraine's top priority is to build an army strong enough to stop Russian military aggression, Ukrainian Prime Minister Arseny Yatseniuk said on Friday, as he made recommendations for top positions in a new coalition government. 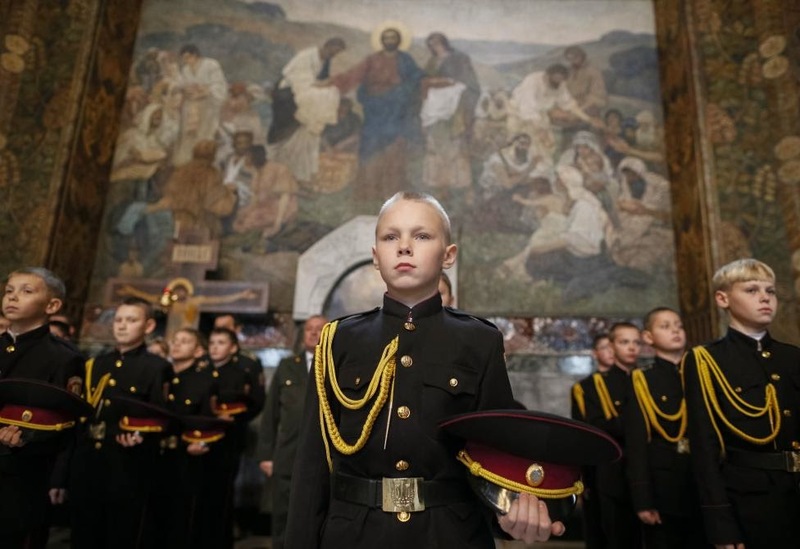 New young military cadets take part in an oath-taking ceremony at the Kiev Pechersk Lavra monastery in Kiev, Ukraine November 14, 2014. The prospect of an all-out war returning to eastern Ukraine has piled pressure on the country's struggling economy, driving the hryvnia currency down by some 17 percent this month and pushing borrowing costs sky-high. Ukraine's pro-Western leaders and NATO have accused Russia of sending soldiers and weapons to help pro-Russian rebels in eastern regions launch a possible new offensive in a war that has killed more than 4,000 people since April. Yatseniuk is in power-sharing talks with President Petro Poroshenko and others to form a coalition as quickly as possible following an Oct. 26 election, won by groups led by the president and prime minister, who with other pro-Western forces swept pro-Russian groups out of parliament. Increasing violence, truce violations and unmarked armored convoys traveling across the rebel-held region have aroused fears that a shaky Sept. 5 ceasefire could collapse. Kiev says the convoys are carrying Russian troops; Russia, as it has in the past, denies its forces are there. "Building an army, which is capable of stopping aggression from Russia, is the number one task," Yatseniuk told journalists. The Russian-backed rebels struck a bellicose tone. "If they (Ukraine) move from building up forces as a demonstration, as a threat, to some concrete action, we are ready for this," Alexander Khodakovsky, a senior separatist military figure, told reporters. Yatseniuk, who is expected to remain as prime minister in the new cabinet, said he did not expect Ukraine's economy to grow before 2016 due to the costs of the conflict. One of the first tasks of a new government would be to come up with a new budget that he promised would be "very tough." The new government would implement reforms required under a $17-billion International Monetary Fund loan program. A Ukrainian military spokesman said shelling between government forces and rebels had continued in the past 24 hours in the eastern Donetsk and Luhansk regions, with one soldier and one five-year-old child killed in different attacks. Poroshenko told security officials there was "no reason to panic" over the situation in the east. "If events begin to unravel in spite of the peace plan, Ukrainian armed forces today are ready and capable of repelling (an offensive)," Poroshenko said in statement, adding Kiev remained committed to finding a peaceful solution to the crisis. Russia warned this week that any resumption of hostilities would be catastrophic for Ukraine after Kiev said it was redeploying troops to be ready for any rebel offensive. Yatseniuk suggested Deputy Finance Minister Vitaly Lisovenko should take the role of finance minister in the new coalition government because of his deep involvement in IMF loan talks. Yatseniuk's People's Front party would support Poroshenko's choice for defense minister and foreign minister, he said. He also recommended the chief executive of state energy firm Naftogaz, Andriy Kobolev, for the position of energy minister.